Keith Mitchell, Clinical project lead, Living with and Beyond a cancer diagnosis, Exeter, UK and Sarah Delfont, FORCE Lead Oncology Support Specialist, Exeter, UK talk about use of The Holistic Needs Assessment to identify the top 10 needs of people with cancer. Mr Mitchell explains that The Holistic Needs Assesment included a questionnaire for specialist nurses to fill out based on what needs they perceived patients have. Mrs Delfont goes on to explain that the reason this assessment was used was because assumptions about what the top 10 concerns are, did not want to be made as making these assumptions can be challenging. This is due to concers being very influenced by various things such as demographic, geography, age and the time that they are being asked. 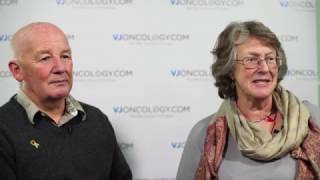 Recorded at the 2016 Annual Meeting of the Oncology Nursing Society (ONS), held in Brighton, UK.